“The Bridges of Madison County’’ is essentially a Hallmark Channel movie set to music and performed live. But no Hallmark movie has ever had an actress like Jennifer Ellis in the lead role. Granted, her virtuosity is not exactly stop-the-presses news. In the past few years Ellis has emerged as one of the brightest lights in Boston musical theater, a leading lady with a lustrous soprano who invariably delivers. But it’s nonetheless seriously impressive to see her find an extra gear in M. Bevin O’Gara’s production of “Bridges’’ at SpeakEasy Stage Company. In terms of emotional range, sensuality, and psychological acuity, this is the best performance I’ve seen Ellis give. Between her nonpareil singing and the conviction she brings even to the most overripe lines, Ellis elevates and deepens material that is soapy and soggy enough to make Douglas Sirk blush. In a sense, she does for the musical adaptation of “Bridges’’ what Meryl Streep did for the (non-Hallmark) 1995 film version of the runaway 1992 bestseller by Robert James Waller, who died a couple of months ago. The production is fluidly directed overall by O’Gara, though Act One is marred by sluggish spots that seem largely the fault of Marsha Norman’s book. It’s never long, though, before the gorgeous score by Jason Robert Brown swoops in to the semi-rescue, smoothly performed by a seven-member SpeakEasy orchestra led by music director Matthew Stern. 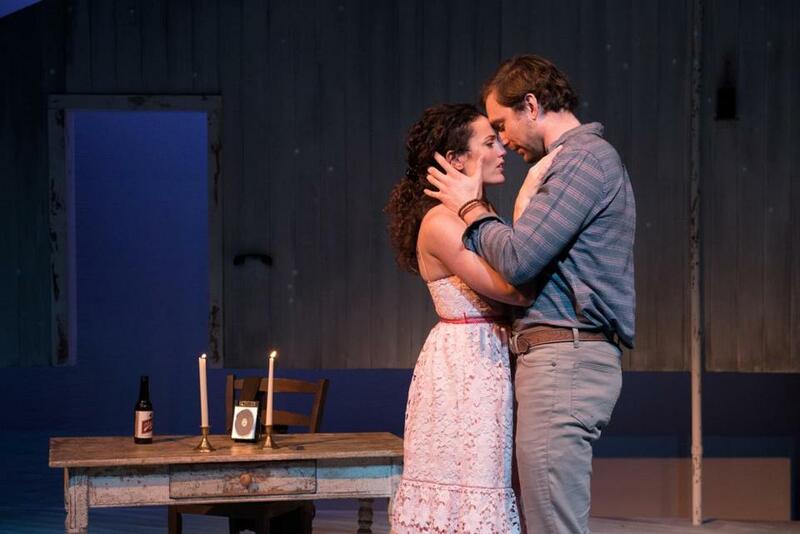 The strong-voiced Christiaan Smith comes pretty close to exemplary as Robert, who is photographing the covered bridges of Madison County when he wanders into Francesca’s life. “Falling Into You,’’ the all-or-nothing duet between Robert and Francesca that closes Act One, is a thing of beauty. But Smith can’t transcend the limitations of the one-dimensional fantasy figure he’s asked to play in a story that is an eye-rolling farrago of romantic clichés: Married woman who had resigned herself to a life of disappointment finds her long-dormant passion awakened by studly yet sensitive man, and Suddenly She Has a Choice to Make. On the surface, it doesn’t seem like a very hard call, frankly. Christopher Chew, who played the urbane Henry Higgins to Ellis’s Cockney Eliza Doolittle in Lyric Stage Company’s “My Fair Lady’’ two years ago, is now decked out in blue overalls and a plaid shirt to play Francesca’s fundamentally decent but oh-so-dull farmer husband, Bud. In a large, bushy gray beard, Chew looks like a cross between Grizzly Adams and a member of the 2013 Red Sox. Then there are Francesca and Bud’s bratty, perpetually squabbling teenage children, Carolyn (Katie Elinoff) and Michael (Nick Siccone), who can’t seem to enter a room without a cacophony of complaints about each other. After a few glimpses of our heroine’s stifling domestic situation, you sit there thinking: Run, Francesca, run! Bud and the kiddos give Francesca the perfect opportunity to flee when they head off to Indianapolis for a few days so Carolyn can show her prize steer at a 4-H fair competition. Francesca’s every move is closely monitored by nosy neighbor-friend Marge (Kerry A. Dowling, conveying the character’s humor and heart). Will McGarrahan, as always, is an asset, playing Marge’s long-suffering husband, Charlie. No sooner have Bud & Co. headed off to the fair than Robert is at Francesca’s door, asking for directions. Her attraction to him is immediately palpable; his to her, less so. But it becomes evident soon enough.